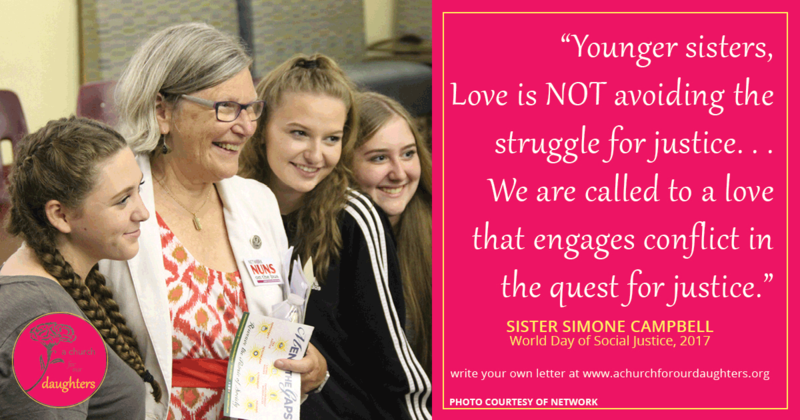 Sister Simone Campbell is the executive director of NETWORK Lobby for Catholic Social Justice and leader of the Nuns on the Bus campaign. The views expressed in this letter are her own. I write to you to share the deep truth that you are the gifts that we have been waiting for. We need your insight and passion. Know that your journey is the story we need to create a just world. I pray that my few words might nourish your passion and engagement for a world where the common good is at the heart of all political engagement. I can with great certitude proclaim that we need you to commit to a life of engagement. In this moment of political chaos in our nation my heart aches with the suffering of so many. I weep for migrants and refugees fleeing violence and persecution. I weep for those working 2 or 3 jobs to try to support their families. I weep at political polarization that does not put the concerns of our people at the heart of decision making. I weep that many religious leaders are silent or only whisper about this anguishing reality. I want you to know that it doesn’t have to be this way. In fact, it has not always been this way. As a young person I was deeply touched by the struggle for civil rights in our nation and the many faith leaders who were part of that movement. Pope John XXIII’s encyclicals Pacem in Terris and Mater et Magistra affirmed my instinct that faith and the Gospel have political consequences. These two documents and the tenor of that time caused me to join my religious community the Sisters of Social Service. I want you to know this because it is a story that is often unseen in our church whose dominant story is often about hierarchy. My community was founded in the 1920’s in Hungary by women who were at the heart of the women’s suffrage movement. The woman who led our community, Margaret (Margit) Slachta, was the first woman in the Hungarian Parliament when she was our leader. Our Sisters, under Margaret’s leadership, are credited with saving over 1,000 Jewish refugees in World War II. They also started the first schools of social work in the country. They were faithful women, passionately engaged in the struggle for justice. They paid a price for their commitment. The community in Central Europe was suppressed during Communism. Many of our Sisters were jailed because of their political engagement and their faith. But they remained faithful to the call to live the Gospel call to justice. It is in this treasured tradition that I have done my work as a lawyer and activist. My faith challenges me to engage in living the challenging Gospel call to love…even your enemies. I want you to know that loving is the only way that will create change and not eat us up in the process. I hope you, younger sisters, learn that love is not letting everything drift. Love is NOT avoiding the struggle for justice. Love is NOT “going along to get along.” No! We are called to a love that engages conflict in the quest for justice. This love is stronger than hate…and stronger than apathy. We are called to a love that weaves us together. This love means that I don’t leave anyone out of my care, even if I don’t agree with them. Through this love we come to know that we are “one body.” We are all connected and our quest for justice is the effort to live this reality. The quest for a justice built on love is daunting. But what I have come to learn is that this journey must be a quest for a shared vision of what justice would look like. This means being able to articulate together the world we seek. For us here at NETWORK Lobby for Catholic Social Justice, this means articulating what policies that will “Mend the Gaps” look like. We seek a world where tax policy does not preference top income people and preferences living wages and family friendly work places. We seek a world where all can use their voice through the ballot box and all have healthcare. We seek a world where immigrants are honored and have a path to citizenship and all have a dignified place to live. By sharing a vision we know that we can struggle together to make it real. It is not easy, but it is well worth the struggle. So my young sisters, I invite you to share this journey where love is the anchor and the challenge. This is the bedrock of the Gospel and social justice. This is how we can create the world we hunger for. It is also this very quest that weaves us together in community. Community is the source of our strength for this journey. We are one body. Together we can live the justice we seek.